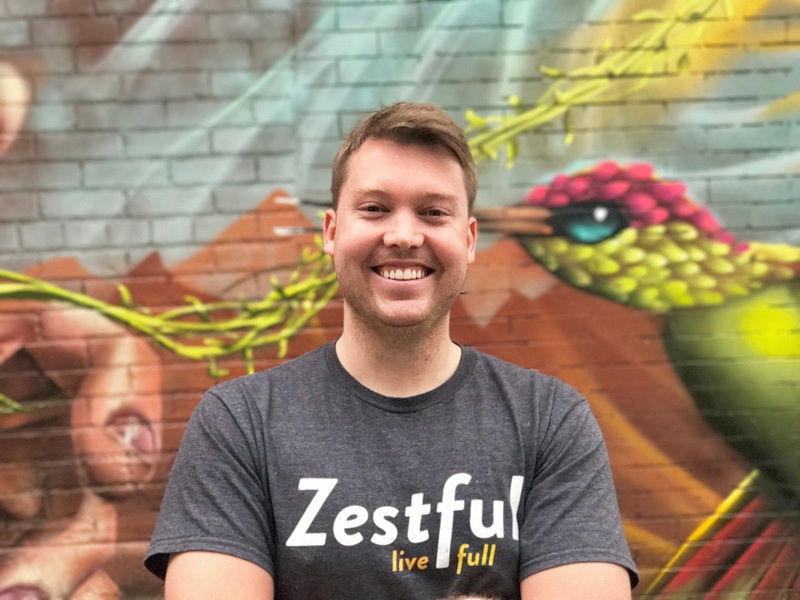 Mat Vogels, co-founder and CEO of Zestful is one of the ten most purely talented people I’ve ever known. I’ve been saying that for five years now on an informal basis, and I wanted to take this opportunity to say it formally. This is the first installment of a new idea. It's example of something I value in my own leadership -- spotting organic talent and giving it runway -- and it's an appreciation. I met Mat Vogels in the summer of 2012. He was a junior social media marketer at PaySimple, working in one of the departments I led. It didn’t take long to appreciate Mat’s range. The thing that stood out first was his creativity. He began designing things for social that far exceeded the quality we were seeing from our in-house designer, whom we ultimately let go as a result. Mat gave me that extraordinary experience of taking an idea for something, spending 20 minutes on it, and delivering something that radically amplified the original idea I had. Mat was (and is) fast, creative, game to jump in on something brand new to him, and capable of working on countless projects simultaneously at a very high caliber (we did have a few conversations about his side gigs, but I eventually realized it only made him better in his work with us). Moreover, Mat was a complete delight as a colleague -- warm, friendly, outgoing, intellectually (voraciously) curious, and always willing to help. He was raw talent, and it was apparent to me that he would thrive and perform best with a long stream of new and different challenges. Mat eventually left PaySimple and began doing web design and development on his own. I was consulting at the time, and I had the chance to engage with Mat on a number of projects for my clients and friends. He discovered Y Combinator graduate Webflow -- a tool that allows designers to deliver high-end websites without coding. He used Webflow to create many new sites and brands, including the digital faces of me, the Conscious Leadership Group, Kaley Klemp, Bookshark, Dharma Comics, FrictionLabs, LightLab Studios, and many more. When Elizabeth, Hannah and I were ready to create an accelerator for companies with at least one female in leadership -- which we named “MergeLane” after 15 minutes of brainstorming -- it was only natural that Mat would design our logo (we took his first try) and our website (which we still happily use 2.5 years later). When you hear me or these others talk about Mat, they regard him as nearly magical. His ability to listen to a need and create something that meets or exceeds that need is unmatched against almost every person I’ve ever known. Mat got so engaged with Webflow as a user during its early months that he was asked to join full time shortly after. They recognized his talent from their user base. Think about that. After working near so many startups, Mat decided he was ready to leverage his skills and creativity in the development of a product that could grow bigger than him or his (admittedly near-infinite) bandwidth. In 2016 he launched Zestful in partnership with his co-founder (also from Webflow) Jeff Peterson. Zestful helps companies deliver perks employees love and value. With Zestful, a company can can create monthly group activities seamlessly from inception to experience. He and the company were accepted into the first 2017 batch at Y Combinator, and are working with some of the best companies in the world. You might wonder why I would write a blog post about one person. It’s a fair question. Because I introduce Mat to lots of people, and here I get to tell this story once -- hopefully well -- and efficiently share it with others. Because I am proud that I had a chance to connect with Mat early in his career. I am grateful that I saw how rare he was, and I think spotting and nurturing talent in this intentional way is a critical component of mentoring and leadership. Because it’s something Mat would do. I know this because even in the midst of the intensity of Y Combinator, Mat will still fix an issue with our site. And last week, Mat reached out to say that he and his co-founder Jeff would be in Colorado for a few days. He asked whether we might like the two of them to meet with every MergeLane team to provide advice on their branding, sites and UX. Um. Yes. Yes we would. Mat is one of the ten most purely talented people I’ve ever known. I’ve been saying that for five years now on an informal basis, and I wanted to take this opportunity to say it formally. The heart of MergeLane is connected to Mat’s heart and talent, and I feel excited to watch how many companies and team members get to touch even a shred of that through Mat’s creation of Zestful.